2. Image mixing (two strong signals mix and produce a third undesired signal). 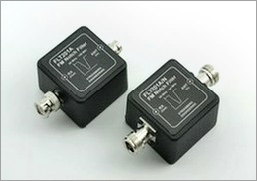 The FLT225 is a High-Pass filter designed primarily for radio monitoring of the military band (225 MHz to 400 MHz). 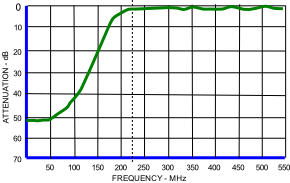 This filter effectively attenuates signals below about 225 MHz, such as Paging (152/158 MHz), FM Radio and other strong business band radios. The FLT225 uses the same die cast aluminum enclosure as the FM filter above, with male/female BNC connectors. 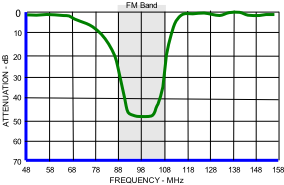 FLT02AM is designed primarily as a BCB (AM radio) reject filter in the form of a 7-section High-Pass-Filter. It can be used in any receiver monitoring platform including as a complement to the Stridsberg Engineering HF multicouplers, MCA102M, MCA104M and MCA108M. We have also available special use filters such as FLT03 3 MHz High-Pass Filter and FLT10 10 MHz High-Pass Filter.